Gravity of Light version 2.0 is a developed version from Gravity of Light 1.0. This version is made to be more durable and designed to be looked like hand knitted textile-like appearance. 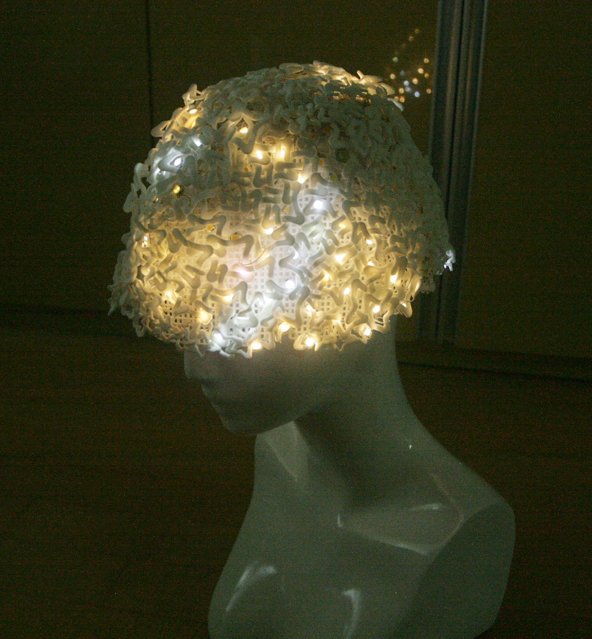 This piece was exhibited at CHI 2013 Interactivity-Exploration in Paris and also presented at White House Fashion Technology Workshop in 2014. What if light on the surface of the wearable textile behaves like it has gravity…? It started with this simple idea of light having gravity like water. <빛의 중력 버전2.0>은 <빛의 중력 버전 1.0>에서 좀 더 발전된 작품으로 흰색 텍스타일과 특수제작된 흰색 전자기판과 센서 및 LED등 으로 은은한 빛과 색으로 디자인된 모자로써 3D 프린트된 패턴이 마치 매우 굵은 실로 뜨개질 된 듯한 느낌으로 디자인된 작품이다. 본 작품은 프랑스 파리의 CHI 2013 Interactivity-Exploration전시에 출품되었다. 제 31회 CHI 2013는 저명한 국제학회로써 40개국이 넘는 나라에서 3,400명 이상이 참관하였다. ‘Gravity of Light 빛의 중력’은 만약에 빛이 물처럼 중력에 따라 흐르고 착용자의 움직임에 따라 찰랑거린다면 어떨까? 라는 상상으로 시작된 웨어러블 작품이다. 착용할 수 있도록 작은 마이크로 컴퓨터와 전자 부품들로 제작된 본 작품은 3D프린팅을 이용한 웨어러블로써 많는 관심을 받았다.